The loud, shrill alarm of a Merlin pierces the afternoon calm. I come to a stop in the ravine we are climbing up and take in the surroundings. It is the first confirmation that this old Merlin territory, which has been deserted for a few years, is now occupied again. Travelling with me are Sigurjón Einarsson, Skúli Gunnarsson and Sveinn Jónsson, or the S Team as we have come to be known. I glimpse the male Merlin in the distance and shortly afterwards the female appears from a small opening in the rock face and takes flight. The excitement among us photographers is tangible in the air. We are in Merlin country. The male giving the photographer the eye. 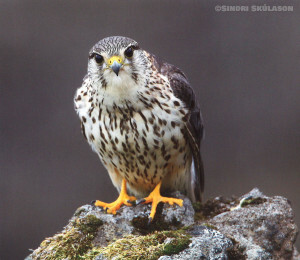 The Merlin is one of the smallest falcons in the world and is in fact the smallest bird of prey in Europe. However, its size can be deceiving as what the Merlin lacks in stature it makes up for in bravery, which sometimes borders on megalomania. As is the norm among raptors, the male is smaller than the female. It defends its territory vigorously and doesn’t hesitate to attack birds much larger than itself, whether Raven, Gyr Falcon or the king of the birds himself, the White-tailed Eagle. They also do not waver when it comes to repelling photographers as the author of this piece can testify. 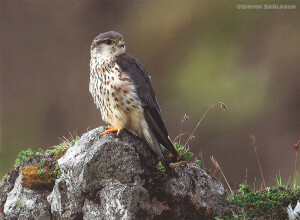 In Iceland Merlins usually breed on cliffs and in ravines in lowland areas and sometimes on the ground. Abroad they also frequently breed on the ground or in trees where they readily use the abandoned nests of other birds. 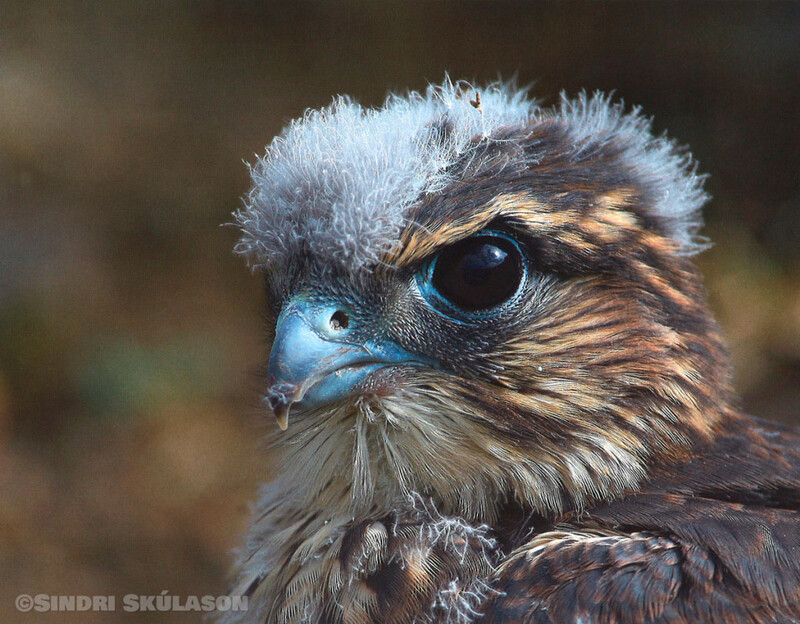 In Iceland they are sometimes known to use old Raven’s nests, as Gyr Falcons do, but it happens infrequently. Merlins don’t really build nests. They just scrape away some soil to make a shallow depression if possible, but never more than that. The pair we were watching chose a nest site at the top of a precipitous ravine. It was situated in a small hollow behind a grass-covered ledge which the young used to sit on as they grew. These Merlins certainly had an eye for choosing a good spot as the surroundings were simply magnificent, typical of the spectacular landscapes found in much of Iceland. Tall cliffs towered over the lowlands, lending the scenery a certain grandeur. 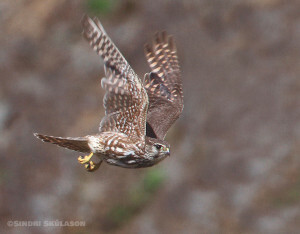 This was the perfect backdrop for photographing this diminutive raptor. The steep slopes made it difficult to put up a photography hide. Fortunately Mother Nature came to our rescue by providing a natural hideout close to the nest site in the form of a small cave in which it was easy to keep a low profile. The ravine was mostly in the shade during the day so there was little opportunity for photography until the sun bathed the slopes in its beautiful afternoon light. Merlins, like other raptors, do not care much for the company of people but this pair became accustomed to our presence amazingly quickly and seemed to grasp early on that we posed little danger to them. The male usually made a noise when he caught sight of us in the distance but quietened down when we came closer. The female had stopped flying off the nest when we appeared. We monitored the breeding site for eight weeks (from the last week in May until the middle of July) but we only made brief visits on each occasion to minimize disturbance. Long-focus lenses are extremely useful in these conditions and allowed us to keep at a reasonable distance. I made a total of 12 visits to this territory, either on my own or with others from the group. We didn’t always have the weather on our side but we tried to make the most of the opportunities we had. Photographing these birds was a very time-consuming business; it took one and a half hours to drive to the site from Reykjavík and a further 20 minutes to climb up through to the ravine before the session itself began. When photographing a bird at its nest a great deal of time is spent waiting and very often nothing much happens. Patience is therefore a prerequisite. But the time spent waiting soon evaporates when you are looking through your lens at your subject; these are the moments that linger in the memory. You always have to be especially cautious when photographing a bird at its nest and you have to show consideration and respect for it. If the birds are wary or stay away from the nest when the photographer is near, you have to be prepared to back off and move away. No photograph is worth endangering the bird and nobody wants to be responsible for a failed breeding attempt. The photographer’s objective should always be to merge into background so that the photos show the bird going about its natural, everyday routine. The pair we were watching had three eggs; Merlins can lay up to six. The female incubated the eggs for about four weeks and the male seemed to play little part. 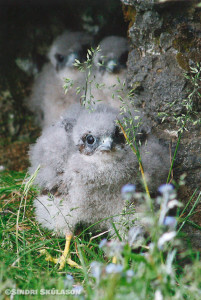 After hatching the chicks spent a further four weeks in the nest. Both parents went out hunting, one guarding the nest while the other was away. This came as a surprise to us as we had been under the impression that male was largely responsible for hunting until the young had fledged. Meadow Pipit and Northern Wheatear were popular items on the menu, while a bit of variety was added with Redwing and young waders. The parents plucked and decapitated the prey before it was taken into the nest and given to the open-mouthed chicks. For the first few days the parents fed the young, but as the chicks grew stronger they begin to tear at the prey that the adults left for them. The chicks thrived under the watchful eyes of their parents and it was fascinating to watch them grow from little balls of fluff into handsome young with a spark in their eye. I almost felt as though I had a part in their upbringing after having watched them grow up for so long. I have to admit that my heart began to beat a little faster when they flapped their wings for the first time, just like a proud parent. For the first few weeks upon leaving the nest they tend to stay in the vicinity as the parents continue to bring them food for some time and teach them how to survive. After two to three weeks they are considered to have graduated and are ready to take on the world outside. 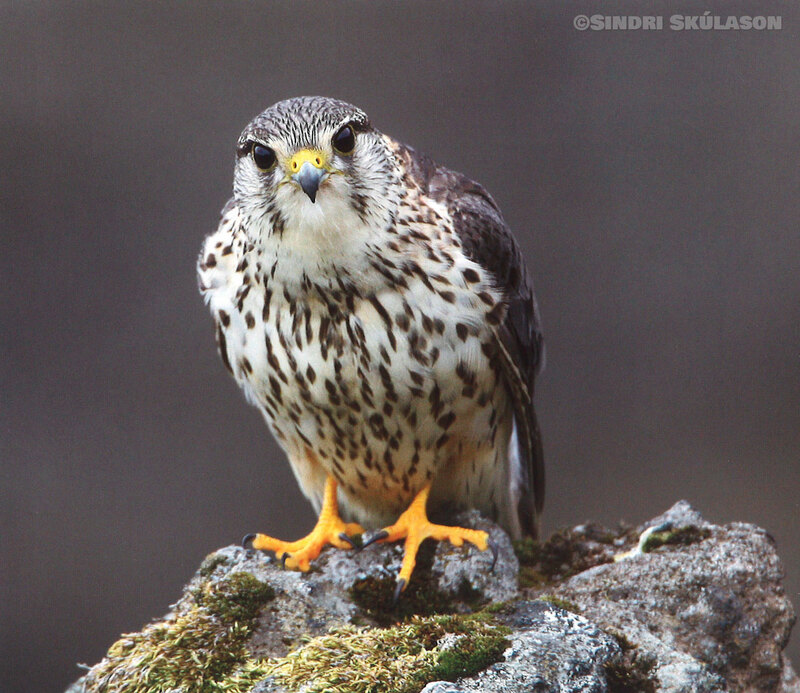 The Merlin is a migratory bird in Iceland although there are always some birds which remain here in the winter. It hunts in the lowlands, seizing its prey on the ground or chasing them down and exhausting them in flight. They are extremely skilled in the air and cover a lot of ground. It’s sheer joy to watch the juveniles perform their aerial acrobatics as they are often foolhardy and bursting with self-confidence. It is therefore not unusual to see young Merlins attack large prey which they have absolutely no chance of overpowering. I got to experience the infinite bravery of the Merlin first hand. On one of the occasions we visited the area we were dismayed not to be able find one of the chicks. We usually saw all three of them sitting on the ledge in front of the little cave, surveying their surroundings. Finally we decided to approach the nest to check that everything was all right. To my great relief I caught a glimpse of the missing chick crouched in the cave, out of sight from our hideout. As I turned away from the nest I felt a rush of air just by my head and a sting as the Merlin’s talons left two big scratches along my scalp. It was the male, rather displeased at my having broken our tacit agreement to keep a reasonable distance from the nest. However, it was as if he pardoned me because soon afterwards he came and sat very close to me and allowed me to take some photos in an act of forgiveness. In fact I wasn’t too upset to have been bloodied in this way; a wildlife photographer once told me that you aren’t a genuine photographer of raptors until you have landed in a scrape or two. I now felt that I had joined the club. It was an absolute privilege to be able to observe these Merlins growing up, from the laying of the eggs until the young fledged; it was an experience that money can’t buy. These are the true moments of value which life offers and you bow your head humbly to Mother Nature. Pictures like these only capture a few moments in the river of time but the experience will remain with me forever.